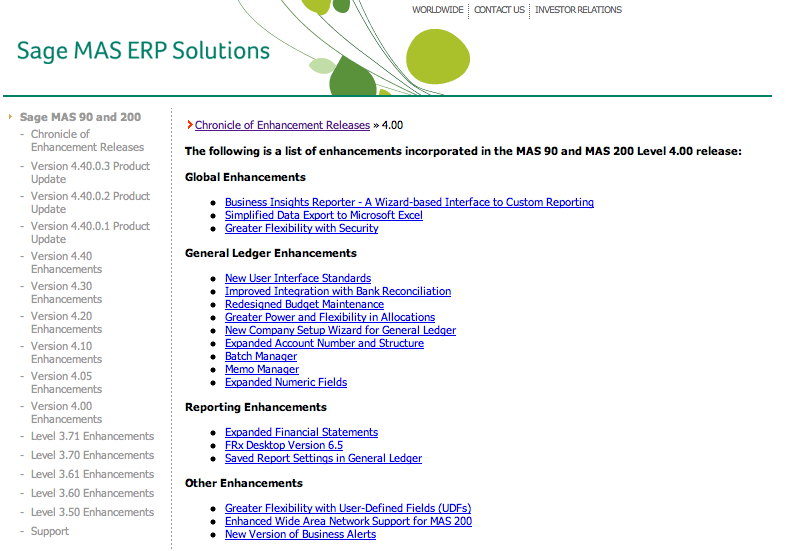 Have you just upgraded your Sage 100 ERP (Formerly Sage ERP MAS 90 and 200) to the latest version? Are you considering upgrading and interested in what the new features are in Sage’s latest release? Here’s a PDF file that my 90 Minds group pulled together. It’s nothing more than a compilation of the version 4.2 to version 4.5 “What’s New” PDF documents that you can obtain by searching on Sage’s site – however it may be a little more convenient to download as one bundle. 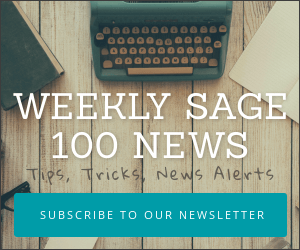 What’s New in my Sage 100 ERP v4.5 Upgrade? What’s New In The Latest MAS90 – MAS200 Upgrade or Product Update? One of the frequent questions that users of MAS90 and MAS200 will have prior to upgrading is “what’s changed?”. It’s a pretty common — and smart — question that you’ll want the answer to prior to installing either a major upgrade (moving up a point or full version) or a product update. Major upgrades are considered to be any that move you up a version of the software. For example moving from MAS90 3.71 to 4.40 would be a major upgrade since during the move you also have pretty significant changes to General Ledger, Accounts Receivable, Accounts Payable, Sales Order, Inventory, RMA, Purchase Order and Bank Reconciliation. Once you reach level 4.40 then the upgrades will start to be intermingled with what Sage terms Product Updates. In theory these Product Updates are user installable collections of both product fixes and new features. Presently Sage have released three product updates for MAS90 4.4 (Product Update or PU 1,2,3). Curious about what’s been added in each version of these upgrades or updates? Sage embeds a web link within the latest version of MAS90 4.4. However if you’ve not yet installed the upgrade then you may have some trouble locating the link to answer your “what’s new” questions. Therefor you can use the link below to navigate directly to the web page chronicling every enhancement added to MAS 90 from version 3.50 to 4.40 Product Update 3. Have you been unable to sleep at night wondering exactly what Sage will put into MAS90 and MAS200 version 4.4 when it officially appears in the first quarter of 2010? While I can’t guarantee that every single feature listed will make it to the final release, I can give you some light reading (40 pages worth) that should help you sleep better. This Pre-Release Guide for MAS90 and MAS200 4.4 has lots of screen shots and information on what to expect in the new release.